How much money will you need in Iceland? kr21,917 ($183) is the average daily price for traveling in Iceland. The average price of food for one day is kr3,783 ($32). The average price of a hotel for a couple is kr21,097 ($176). Additional pricing is in the table below. These average travel prices have been collected from other travelers to help you plan your own travel budget. How much money do I need for Iceland? Iceland is a beautiful country in the North Atlantic ocean. About ten percent of the country is covered by glaciers and natural beauty is abundant throughout the countryside. There are also many geothermal hotspots around the island. Iceland is very close to the Arctic Circle, so it is important to consider what time of year you plan to visit. The days can be long in the summer, and very short in the winter. During June, the sun only sets briefly and it never gets completely dark. Alternatively, in December there are almost 20 hours of darkness. During the equinoxes in March and September, the days and nights are approximately the same length and comparable to elsewhere in the world. Despite Iceland's proximity to the Arctic Circle, the climate is not as cold as you might expect. In fact, Iceland is a great place to visit in November. Most visitors to Iceland choose to rent a car. This allows for the most flexibility and lets you see the beautiful countryside at your own pace. Most of the popular sites throughout the country are easily accessible with good roads, but if you hope to get a little more off the beaten track, consider renting a four wheel drive vehicle. These cars can be in high demand so plan well in advance. If you're not interested in renting a car, you can usually book excursions through tour companies in either Reykjavik or Akureyri. These can be expensive, but will allow you access to the country's most impressive volcanoes and glaciers. The official language of Iceland is Icelandic. It is not uncommon for Icelanders to also speak English and Danish, both of which are taught from an early age in schools. It is still respectful to attempt to speak some Icelandic before referring to English. These efforts will be much appreciated. If you learn a few phrases ahead of time, you'll be well respected for your efforts. Krona is the local currency in Iceland. It is recommended that you buy and sell krona in Iceland, where you will get the best exchange rate. Most business accept credit cards. Credit cards are also accepted by taxis and souvenir stands, so you really don't need to carry a lot of cash with you. If you're looking to buy some interesting, local products, consider purchasing items made from Icelandic wool. The Icelandic sheep is unique and makes a soft but durable wool that is woven into hats, gloves and more. Other interesting local items include arts and crafts such as musical baskets and porcelain sculptures that can be found at the local craft shops. Winters are surprisingly mild in Iceland. There is a maritime temperate climate and the winters are somewhat comparable to those in New England. Do be aware that the weather conditions can change rapidly. Although winters can be warmer than you might expect, summers are also quite cool, so come prepared for temperatures around 20 degrees Celsius during these months. A favorite activity in Iceland is to go hiking. Some of the hiking is quite intense so come prepared with good walking boots and some food. Also, be prepared for the changing weather conditions as a beautiful day may suddenly be interrupted by a strong storm, particularly during the winter months. The Blue Lagoon: This is a world famous Geothermal Spa in the southwestern part of Iceland. 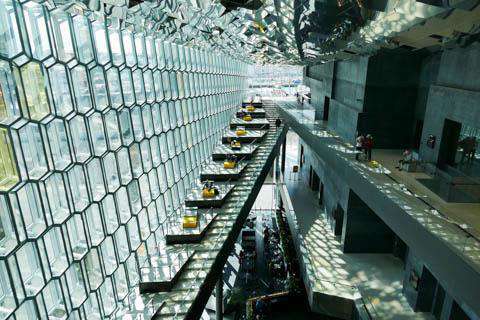 It is halfway between Keflavik Airport and Reykjavik, near the town of Grindavik. Its warm, mineral rich waters are the result of the nearby Svartsengi geothermal power plant. Bathing in this pool is a popular activity for almost all visitors to Iceland. The Gullfoss Waterfall: Also called Golden Falls, this 32 meter high double waterfall is found along the White River. It is typically largest in the summer when the rains and glacial runoff are at their peak. It's also the largest volume waterfall in Europe. You can drive yourself to the falls, or take one of the many tours along the Golden Circle. Geysir: This hot spring is the namesake for all geysers around the globe. It's also one of the most popular destinations in the country. Nearby are several other geysers which erupt more frequently, as well as some impressively colored hot pools. Icelandic food has continued to evolve in recent decades. In the past the cuisine was dominated by lamb and fish as staples but in recent years the options have diversified significantly. It's still a difficult country to visit as a vegetarian, as most dishes include some form of meat, but there are now several vegetarian restaurants in the capital city, and a few vegetarian options are found on most menus. Skyr: This is a dairy product that is local to Iceland and is similar to yogurt. It is found throughout the country and comes in both unflavored and flavored varieties. Harofiskur: This is a popular snack throughout the country. It is made with dried pieces of fish that are served with butter. It's also a good accompaniment with coleslaw. Pylsa: This fast food item, basically a hot dog, is usually served with fried onions or fresh ontion, ketchup, mustard, and remoulade. It's a good cheap option if you're looking for something filling and quick. It's found in most convenience stores or small shops around town.